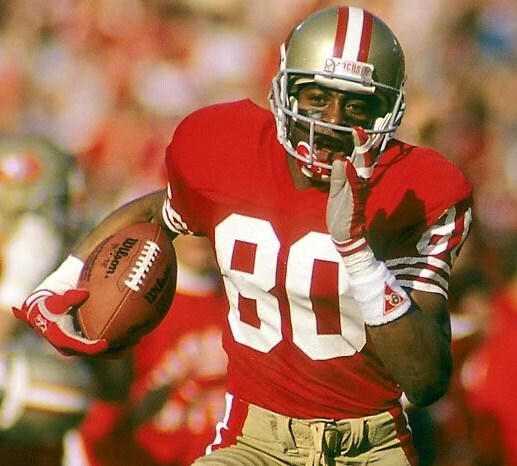 Jerry Rice was just voted the greatest football player of all time by a blue-ribbon panel on the NFL Network. He had a stellar 20 year career as a receiver, but is there any current receiver that can catch him? You won’t get too many arguments when it comes to claiming Jerry Rice is the greatest football player in the NFL ever. He holds just about every receiving record available, and played longer than just about any other player ever. He had 22,895 receiving yards, 1,549 receptions, and 197 touchdowns. But, are there players that have an opportunity to break the receiving records of the greatest of all time? Ever since the early 80’s, passing has become more and more prevelant in the NFL, and receivers are becoming the stars of the league. Because of this, I do believe in this era, there are some receivers that may be able to catch the great Jerry Rice. They key for any of these receivers to break the receiving records of Jerry Rice is longevity. No receiver played longer than Jerry Rice in the history of the NFL. There have been only 17 total receivers who have played over 15 years in the NFL. Only one player, other than Jerry Rice, played over 17 years, and that was Charlie Joyner who was a receiver in the NFL for 18 years. If any of these players can last as long as Jerry Rice, and end up breaking his records, will that place them at the top of the list as being the greatest NFL player of all time? ~ by Troy Erickson Realtor on November 9, 2010.